considered a double planet system because its largest moon, Charon, is about half Pluto’s size. It takes Pluto 248 years to orbit the Sun. A temporary nitrogen-methane atmosphere forms when Pluto's surface ice thaws, when Pluto is closest to the sun. 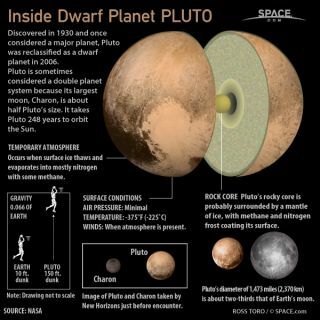 Pluto’s rocky core is probably surrounded by a mantle of ice, with methane and nitrogen frost coating its surface.